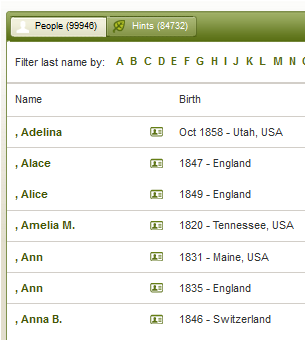 A few tricks I've found helpful in identifying maiden names quickly on ancestry.com - please note - it helps to have an extra monitor. Do this for each person missing a maiden name - I use firefox since it keeps tabs the same size, but allows scrolling when there are too many tabs to fit. Once you have selected this for all tabs, start with one person - looking at the tree, see if the husband or children have hint leaves popping up. I prefer starting with children for more accurate results, but husband works as well. 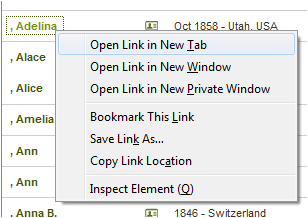 Then right click on the leaf, and select "Open hints in new window". If you are using a separate monitor, you may have to pull the new window to the second monitor the first time you do this, but the next time, it will automatically go there. Check to see if there are any hints that show the mother's maiden name. Be sure to check in any ignored hints. If you aren't having any luck, click on the person's name at the top to open up their profile. 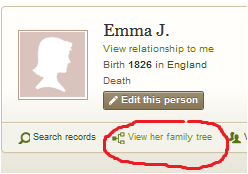 Then click "search records" - "family trees". 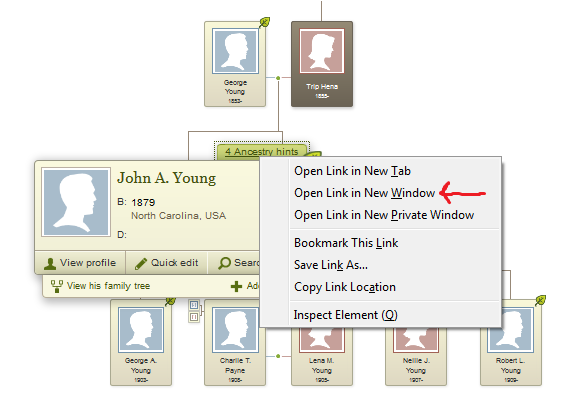 Once you identify a tree showing the maiden name, scroll your mouse over the person in the original window, click "Quick Edit" and simply add the name! One of the benefits I've found to doing this every few days, is that the "view family tree" option triggers hint searches within the site, so if you have added people recently through hints, but haven't viewed the tree, the system may not have searched for hints yet. Opening the tree solves this, leading to more of those wonderful green leaves. When I'm still not able to find the maiden name through the above steps, I edit the last name with an asterisk (*) - so that I know I've done the search. Doing this moves the person to a second group of people after those without maiden names when you are looking in the "view all people" collection, but doesn't trigger the site to think it's a last name (like "Unknown" does). I think consider the asterisked last names to be a longer term to-do list for deep dive researching.